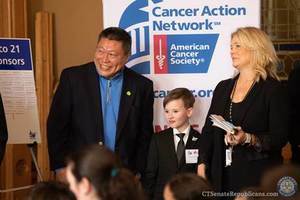 Hartford, CT - State Senator Tony Hwang (R-28) joined the American Cancer Society, youth leaders and their parents for an advocacy event concerning a Safe & Healthy Connecticut on April 10th to support the passage of a health and safety bill aimed at combating youth vaping and nicotine addiction. HB 7200 - An Act Prohibiting the Sale of Cigarettes, Tobacco Products, Electronic Nicotine Delivery Systems and Vapor Products to Persons under Age Twenty-one was favorably reported out of the Public Health Committee on March 22nd and awaits a vote in the CT General Assembly House and Senate. This bill would raise the minimum age to purchase cigarettes, tobacco and vaping products from 18 years old to 21 years old. Senator Hwang has emphasized his respect of individual freedom of choice for those 21 years or older to make their own personal health decisions, without government mandated policies. However, he stands strong with the American Cancer Society to combat the surge of vaping and nicotine addiction in youth under the age of 21. According to the 2018 FDA National Youth Tobacco Survey (FDA Youth Report), increased use of e-cigarettes (78% increase among high schoolers, 48% increase among middle schoolers) has driven a 38% increase in use of any tobacco product among high school students. Medical science has proven that brain function and physical health is severely affected in those using nicotine that have not yet fully developed. Widespread youth use has become commonplace. The 2017 CT Youth Tobacco Surveillance Report revealed that among teens who reported using electronic cigarettes within the last 30 days, 59.3% said they obtained them “From a Friend”. This bill seeks to lessen the chances of teenagers obtaining tobacco and vaping products from friends and classmates who are already 18 years old. You can find the video of Senator Hwang’s participation in the Senate Republican Press Conference on Health & Safety HERE.